Welcome to The Urban Legion! This site is dedicated to making the world a funnier place. 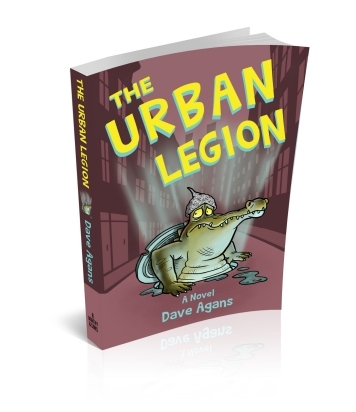 Here you’ll find info about the conspiracy spoof trilogy The Urban Legion and its author, Dave Agans. Don’t take him seriously. The Legionnaire blog page publishes updates about the Urban Legion trilogy, and short articles exposing new, almost-plausible conspiracies–like most conspiracy sites, everything here is guaranteed to be fake news, but in our case, it’s just for fun. Don’t take it seriously. The Yucks-Files are dedicated to finding funny fiction hidden in stacks labeled “mystery” or “thriller” or “sci-fi” or anything other than humor. Check out the descriptions and reviews, and read the books. And don’t take them seriously. The Contact Us page gives you a way to get in touch. We’d love to hear your recommendations for funny books to review or humorous urban legends or conspiracies you’ve heard about. At the bottom of every page is a link to read The Urban Legion, and a sign-up to get occasional emails on new Urban Legion developments and Yucks-Files book reviews. Men in Black for tin-foil hats. A stranger (who claims to be an urban legend survivor) plunges granola mom Lynn Grady into a high-tech underground war with the evil Corporation. As she fights armed French waiters, corrupt golfers, taser-packing car salesmen, and her sold-out grunge-star ex-husband, Lynn discovers the sinister forces behind everyday annoyances. The Urban Legion puts a new spin on conspiracies and urban legends. Food courts and airport restrooms will never be the same. Fans of Christopher Moore, Carl Hiaasen, Christopher Buckley, Kurt Vonnegut, Dave Barry, and even Douglas Adams will enjoy the twisted humor and delightfully plausible revelations. Make your world funnier now!